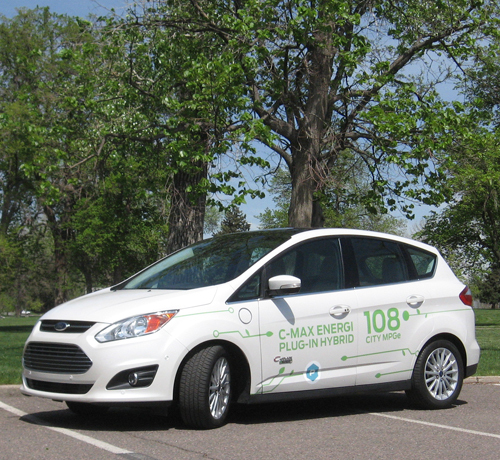 Ford has increased its share of the electrified vehicle market to almost 16 percent during the first half of 2013, a 12-point gain over last year, lead by hybrids like the C-MAX Energi. The boost in acceptance of high efficiency vehicles has helped the automaker realize close to a full percentage point increase in the overall US market share, outperforming any other full-line automaker. Encouraged by the sales performance of hybrid and plug-in vehicles, the auto group is taking steps to improve fuel economy in hybrid vehicles by hiring new engineers and expanding research facilities to cultivate continued growth. Ford’s sales of 46,197 such units through June – over 400 percent higher than the first half of last year – was led by the Ford C-MAX Hybrid and Ford C-MAX Energi plug-in hybrid. The C-MAX is selling well in coastal markets like Florida and Texas, cutting into US sales of the Toyota Prius by 5 percent. In California, where the state has mandated higher mileage, lower emissions and more electric vehicles, Ford has shown the most retail growth of any brand, based on the latest Polk retail registration data. During June, 64 percent of Ford’s C-MAX sales were converts from other brands, and the car most often traded in was the Prius. Electrified vehicles are even helping Lincoln find its niche, as the MKZ Hybrid has recently doubled its production, to keep up with the 40 percent of customers who opt for the hybrid model. Ford is also mining gold in what they refer to as the Super Segment, referring to small cars, midsize sedans and small utility vehicles responsible for 42 percent of the brand’s growth since 2008. Small cars like the Fiesta, Focus and C-MAX, combined for a total of 35,851 sales last month, a 39 percent increase year to year and a 13-year record for small car sales in June. The fabulous Ford Fusion set record sales for the first half of 2013, while the Escape continued its reign as the best-selling utility in America, by posting record sales across the last five months. When you tally that up with Ford F-Series sales, the brand is likely to set the mark for best-selling utility and work vehicles for three straight years. The Ford F-Series has been America’s best-selling pickup for 36 straight years, with over 367,000 trucks sold so far this year – up a full 22 percent over last. • Increasing the maximum pure electric speed to 85 mph from 62 mph, making the electric-only mode functional on the highway. • Optimizing Active Grille Shutters to reduce aerodynamic drag in regard to more driving and temperature conditions, which include cold weather, during air conditioner use and when the engine coolant temperature is higher. • Reducing the electric fan speed in keeping with coolant temperature to reduce energy consumption. • Making required engine warm-up time 50 percent less to enable electric-only driving and shut the gas engine down sooner at stops after cold starts. • Enhancing climate control to reduce use of the air conditioning compressor and lessen the energy requirements in cold weather. To encourage further growth in the electrified vehicle arena, Ford is boosting it s EV engineering team by half to some 500 employees. Another $50 million will go into testing and development centers for such cars in Dearborn. In addition the company plans to double its battery-testing capabilities by the end of the year in hopes of accelerating the development of new electric vehicles by as much as 25 percent.